John Flood's Random Academic Thoughts (RATs): Thought Experiment: What Does the Uberization of Legal Practice Mean? Thought Experiment: What Does the Uberization of Legal Practice Mean? Yesterday I had lunch with Joanna Goodman, a journalist who writes for the Guardian and the Law Society Gazette on matters technological, and we talked about the conservatism of law when it came to incorporating technology. This has led me to a thought experiment I'd like to try out here. First, a couple of assumptions: this is speculation into a distant future. I say this because in my experience it takes approximately a generation for lawyers to change. That although this is a thought experiment I would like to make a distinction, often lost, between expert occupations and professions. Professions have elements of judgment, wisdom and the like that derive from the long cultures that back them. We can't deny that law, as an occupation/profession, has hundreds of years of cultural development and history that are transmitted in all sorts of ways--memes, apprenticeship and knowledge. Expert occupations are often devoid of, or avoid, this type of cultural environment. The thought experiment. The rise of Google, Facebook and Uber signify a number of fundamental changes in the way we live. Data is free. Communication is seamless and no longer bound by time and space as it was in the old days. Ownership is mutating into sharing (the gig economy). Data is empowering in that we can now manage and manipulate huge amounts of unstructured data. 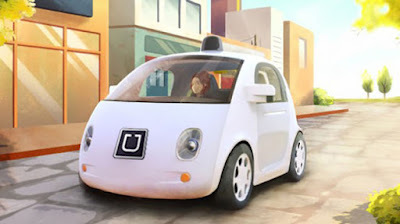 Google has successfully incorporated this into its autonomous vehicles. Amazon is developing autonomous drones to deliver packages to customers. Uber is disrupting the taxi industry everywhere by using data to enable people to use their cars as a taxi service when they want. Of course, Uber is facing backlash from conventional monopolistic taxi businesses. Despite this the move towards uberization seem inexorable. We know from Google, Tesla, and Uber that the weak point in the chain is the human. Humans don't behave like machines and have accidents. Tesla claimed that the failure of its recent enhanced cruise control was far rarer than normal traffic accidents. Moreover, the patch to fix the problem will be transmitted to all Teslas when ready. Compare that to traditional automotive recalls that necessitate individual action. Underlying Uber's strategy is the removal of the human driver. Google's autonomous vehicle would answer this. There is a further aim behind this which is to move people away from "owning" vehicles that are used partially and are wasting assets. Instead of owning we would adopt, rent or subscribe to "personal transport solutions". To get from A to B, I need transport of a kind not necessarily my own vehicle. Streets would be clearer, congestion reduced, and air cleaner. So onto lawyers. At present, we have a lawyer or a law firm. In a pre-Uber sense we own it. The law firm is an expensive conglomeration of people, land and other assets, which makes it expensive to use, and reduces access to justice. Much of legal work can be done without human intervention or minimal human intervention. For example, minor dispute resolution can be done online: divorce, parking tickets, complaints about banks. Document construction relies on computers. With the increasing sophistication of AI and tech, we have entities like ROSS Intelligence based on IBM Watson, Kim, and Ravn that are using unstructured data to improve legal power. What then is the purpose of the law firm? At the moment it is a signalling device: my law firm is bigger or better than yours. This is the bet the bank type of deal. But for most law firms at the consumer end of the market, there appears to be little justification except that they satisfy their owners. And for most business owners there is a feeling that lawyers and law firms don't understand their businesses or want to. How much of what companies need in terms of contracting could be put into smart contracts on blockchain? What if law firms were uberized? Much work would be automated--think compliance, IP, and regulation management. Remember Stuart Brand said "data wants to be free" back in 1984. So much of legal information would be free, like medical information, and the AI will shape it to individual ends. The work that requires a human dimension could be done by real people but wouldn't necessarily require firms. If we need those intangible attributes of professionals like judgment and wisdom or high level advocacy, then we seek out humans for them. But much of this could be done through networks than physical firms. After all, there is little to distinguish one law firm from another. They are largely fungible.